The federal government has agreed to buy up to $30 million worth of canned Alaska sockeye salmon. The announcement was made this week by the US Department of Agriculture Secretary, Tom Vilsack. Photo: Clark Fair via kdlg.org. Last year’s sockeye salmon harvest was a good one. It was the second highest in the past 10 years, totally more than 35 million fish. 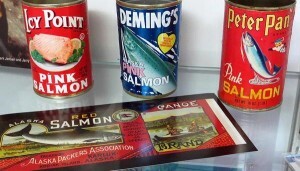 Some of those red salmon ended up being canned and many of those cans have yet to sell. At least, until now. Senator Lisa Murkowski wrote a letter to the USDA requesting a purchase of the salmon through the Emergency Food Assistance Program. Karina Petersen is Murkowski’s Spokeswoman. The fish will be distributed to food banks in all 50 states. Alaska’s Food Bank serves families all over the state through 300 partner agencies. Last year, the non-profit gave out 6.8 million pounds of food to needy families. Canned sockeye salmon will be a welcomed addition to the shelves says Michael Miller, Executive Director of Alaska’s program. One of the challenges with protein is the shelf life. Miller says often times they get frozen meats as donations and while it’s also welcomed, it takes more work. The $30 million to buy the surplus red salmon is coming from existing funds through the Emergency Food Assistance Program. The program has made similar purchases in recent years. Last year, $13 million worth of canned pink salmon was bought and in 2013, $30 million in canned pinks was purchased. The food program has been around since 1983.